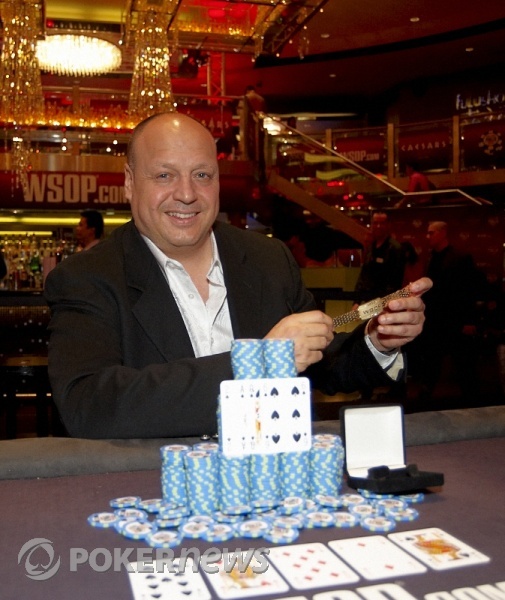 Jeffrey Lisandro is a man who really needs no introduction, but in case you've been living under a rock where there is no poker coverage for the past few years, Mr. Lisandro will tonight be tossing his fifth WSOP bracelet in the pile. This is, though, his first European WSOP bracelet, and also his first in Omaha - his previous four were all in stud poker and were all picked up in Vegas, including three in one Series which earned him the title of 2009 WSOP Player of the Year. Lisandro battled through a very small but unbelievably high-class field, and although he had to outdraw aces right at the end to take it down, that was no small achievement. Coming back with 15 players today instead of the scheduled nine looked as though it might make for a very late night, but in the event the high-variance nature of Omaha and the aggressiveness of the players made up for the extra numbers, and Lisandro will still get to enjoy some of London's nightlife before he returns to his hotel room to reflect on a job well done. In a fast-paced final where almost every player took at least one turn at being chip leader, it could have gone anyone's way. Lisandro seems to have a magic touch at these things, though, and as he poses for his winner's photos (although he did refuse to do any interviews) he looks extremely comfortable and relaxed. As though he could get used to this sort of thing. Many congratulations to Mr. Lisandro, and indeed to all 15 players who made it as far as Day 3. We'll be back tomorrow with the continuing £1,000 NLH event, but from our Omaha outing at the WSOPE, it's over and out. At a big chip disadvantage, and knowing it, Serock went out fighting, although gave up 140k bet-folding a flop leaving him looking to get it in preflop. And so it happened - Jeffrey Lisandro raised pot, and Serock moved in; call. The flop brought straightening possibilities and then some, just Ace high still ahead for Lisandro: , but the turn and river didn't bring them - Lisandro held and now holds a fifth WSOP bracelet! Jeffrey Lisandro had picked up a few small pots, putting his stack at 680,000 when Joe Serock opened for 75,000 from the button. 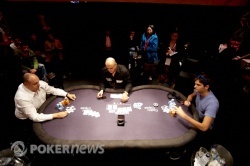 Lisandro made it 220,000 to go, and just a few short moments elapsed before Serock quietly announced, "Pot." A call all in from Lisandro, and they were on their backs. "Smells like a bracelet to me!" called over Shannon Shorr from the rail. But he spoke too soon. There was a brief silence from the crowd; if Lisandro has any supporters here at all, they are keeping a very low profile. Then came a few sad cries of, "Hang in there, Joe!" Whatever the rail's feelings about it, the current stack sizes are Lisandro 1,360,000, Serock 440,000. 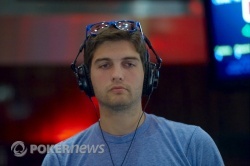 Of the last six hands, four have been won by Joe Serock, and three following the pattern of: Serock raises on the button to 70k, they see a flop, Lisandro check-folds to a 70k bet. These 70ks add up (even when you take into account the big blinds returned to Lisandro in the form of Serock passing preflop) and he's now extended his chip lead back out to 1,300,000 vs. Lisandro's 500,000. Only one hand got past the turn in 15 minutes, when Lisandro (after limping the button pre) called a 45k bet on the flop but folded to a 65k one on the turn. Just a few minutes ago Jeffrey Lisandro was the short stack here - he asked TD Jack Effel to colour up the T1000 chips, but then was most unwilling to part with the two leftover ones, requesting that they be left in his stack rather than removed from play as the schedule required. So perhaps frustrated by his inability to double up in that last hand, Lisandro really turned up the aggression after that, and he has actually now taken a slight chip lead over Joe Serock. More Drama than the Eastenders Omnibus - All In and a Call! River: ! That's a broadway straight each and a crowd-teasing chop!